David Price, 19, son of Dan and Susanne Price, is the youngest of nine musical children. His accomplishments include multiple performances with the Utah Symphony, an appearance on national radio as soloist on NPR’s “From the Top” with the Gifted Music School Orchestra, and a tour of Italy with the Rocky Mountain Strings. A winner of numerous awards, his 1st prize distinctions include 2010 Winner of the Utah Division of the International Stradivarius Competition, four time winner of the Youth Guild, winner of the Utah State Fair, Stillman Kelly, and the state MTNA Solo and Concerto Competitions. His teachers include: Deborah Moench, Jack Ashton, Eugene Watanabe, Dallin Hansen and Denise Farrington (piano). He was a student of the Gifted Music School. 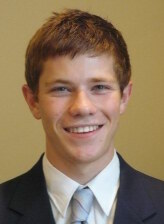 This Fall David attended BYU Idaho and will leave for Berlin, Germany March 2nd to serve a mission for the LDS Church.